This United clock was from a friend of my great aunt. 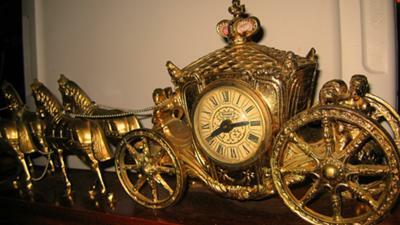 As I am researching, I see that all the other clocks of this type might have been spray painted because the beautiful pink stone that is within the crown on top of the carriage on my clock, is not visible on others that I see online. Also, on most the chain is missing. Hope you can give me some history and value. Could you let me know the value of this clock. It still runs very nicely. It is on a very nice wood base.